1x DJ4 DJ Booth 1x DJ Booth Curtain. DJ Booth Curtain. Best for people who value the ease of unfolding and transport. To fit the DJ4 DJ Booth. 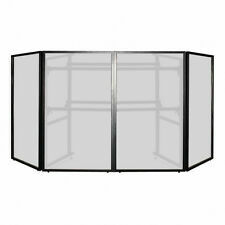 Durable, resilient curtain for DJ-4 and DJ-4T stand. The curtain has 6 velcros for perfect fit to the stand. 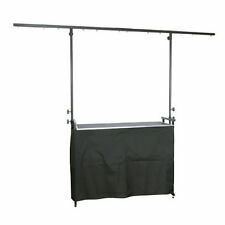 Black Curtain for 4ft Deck Stand. Add to Favourites. 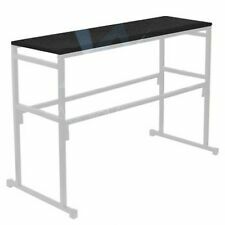 Gorilla Stands 4ft Disco Booth and Dj Lycra 4 Panel Screen Stand - only what is seen in photo, needs new top shelf, easy to cut out from wood. Lycra front panel - black outer otherwise same as photo of new version, Lycra has some stains which I assume will wash out, purely from where it’s been sat in our warehouse for ages. Otherwise structural sound, and looks great backlit. This is from our old hire stock when we supplied a local community hall with disco setups for their own use. Collection from Melksham Wilts. We have a lot of old / new / ex hire lighting and related items as part of our workshop cleanup. While the top lighting bar removes the need for a separate lighting stand, allowing you to create a quick and compact setup. You can also create a DJ style booth by using a DJ screen infront of the stand. Material – steel. available colours - black. Product Range: PULSE DJ Stands. Carry strap. Need more information?. Can I reserve item(s) that I intend to buy later?. How do I find the item number or product code?. When will I receive confirmation of my order?. What if I have not received my order?. Need more information?. Can I reserve item(s) that I intend to buy later?. How do I find the item number or product code?. What if I have not received my order?. When will I receive confirmation of my order?. What is the warranty period on Electromarket products?. Active PA Speakers. Need more information?. How do I find the item number or product code?. What if I have not received my order?. When will I receive confirmation of my order?. Set of four DJ lighting screens. Great value for your money! Panels: 30 x 700 x 1200 mm. Fabulous DJ Stand with highest flexibility and a very stable stand. 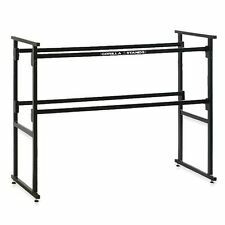 - height of the first table rails: 57cm. - height of the second table rail: 93cm. The DJ just needs 5-8 min to build up the complete system. Product Range: PULSE DJ Stands. However our product range doesn’t end there! Furthermore, VisioSound supplies a comprehensive range of lighting products including moving heads, strobes, and par cans. Weight Set: 21.00 kg. Set Width: 3000mm. Active PA Speakers. Need more information?. Can I reserve item(s) that I intend to buy later?. How do I find the item number or product code?. When will I receive confirmation of my order?. The warranty covers manufacturer faults and does not cover misuse of the item, for example a 'blown out' speaker. Height: 930mm. Power Supplies. Air Conditioners. Active PA Speakers. Need more information?. A fabulous DJ stand with high flexibility and is very stable. It needs just 5-8 minutes to build up the complete system. The 2x integrated lighting stands with T-Bars can be removed if not needed. Height of first table rails: 57cm. You can also create a DJ booth by using a DJ screen infront of the stand. 4ft DJ stand. Product Range: PULSE DJ Stands. Cross beam / shelf depth: 320mm. Stand (WxHxD): 1220x930x380mm. Lower cross beam height: 570mm. This 4 ft universal position stand rig is simply ideal for the mobile DJ or fixed installations. 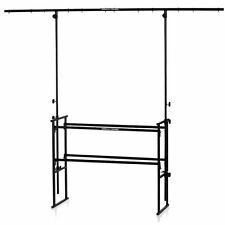 This stand has an extended beam assembly which allows you to place and organise your equipment safely whilst maintaining a professional appearance. Ideal for mobile applications and those who require the ease of folding and hassle free transport whilst allowing for quick & easy set-ups thanks to this supports straight forward design. Optional carry bag available. 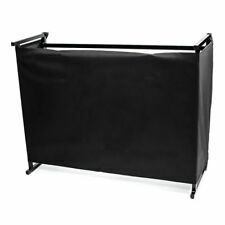 Black Curtain Cover Scrim for 4ft DJ Deck Stand. Condition is New. Made with elasticated tabs going round the top and sides. Will be posted out within 3 working days.